I had the opportunity to try out the Windows 10 Technical Preview recently and I was happy to see that the Start menu has returned with a facelift of sorts. 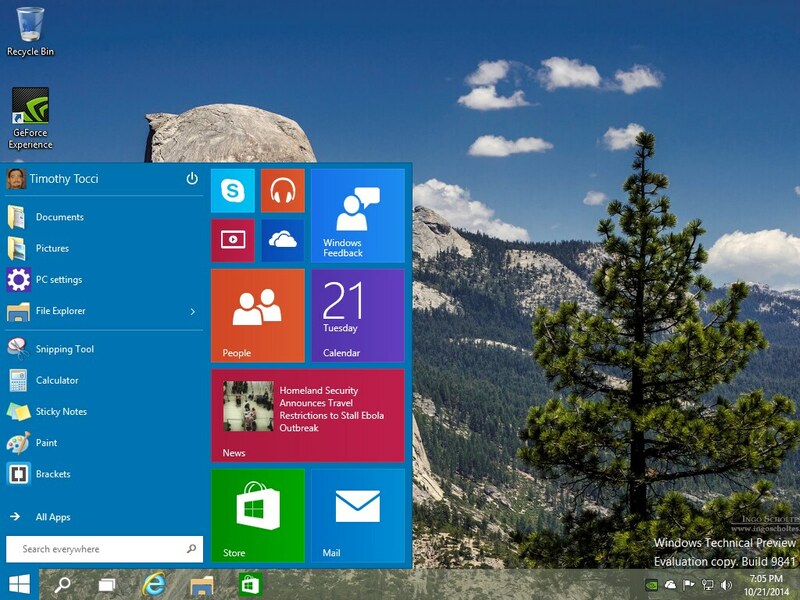 The Start menu on Windows 8, as we all know, was changed to suit a touch interface. This was really great for their premiere surface tablet line up – but for desktop users without touch functionality this left a lot to be desired. Personally, I do far too much on my system to even be able to rely on a touch interface at this point. The keyboard and mouse will not be going away any time soon in my life. Its shameful that Microsoft made the assumption that everyone would prefer that type of, non-selectable I might add, interface. Why shameful? I learned user interface design from Microsoft and MSDN while I was learning Visual Basic 6 eons ago – they have a tremendous investment in it that was ignored in Windows 8 (unless you’re a tablet user that is). Enough of my ranting; Microsoft is fixing the Start menu problem now. Albeit, you’ll have to pay for a new version. There are other, less spectacular improvements on the way as well. 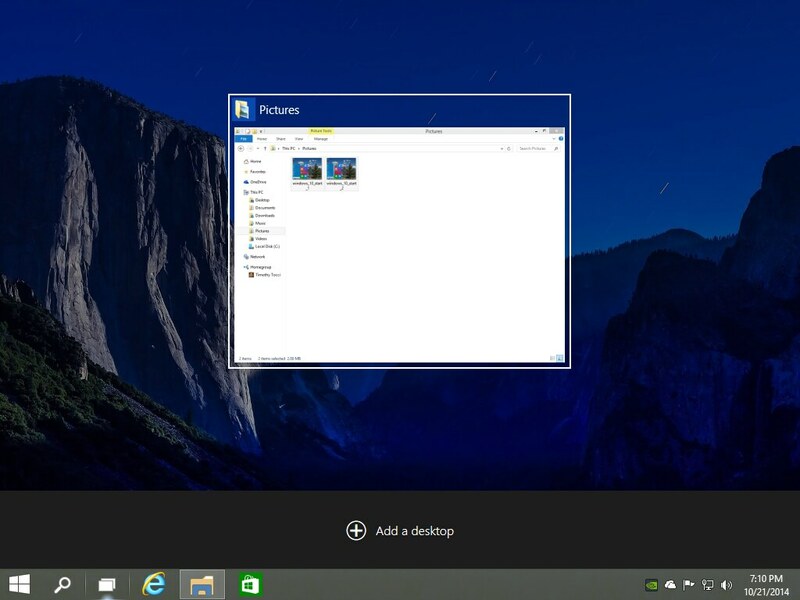 Windows users will have the opportunity to set up multiple desktops and switch between them. Granted, most Linux users have had this feature enabled on their desktops since the dark ages – now Windows has it. Window snapping has also been improved with selectable stacking (or tiling) with more than two windows. In the preview version I was using there was gaps between the snapped windows that made it less desireable. I have to assume that this will be remedied by the release date however. I would have really liked to put Windows 10 through a couple of months of hard usage but my Nvidea drivers refuse to install as the version number is unrecognized by the driver installer. So I shouldn’t say I had the full “user experience” when I tested it. (Everyone knows – no video drivers = poor computing experience). Still, overall, it ran as well as Windows 8 on my box. Windows 10 is still a work in progress. In my opinion it has a long way to go before they should actually call it a new version. It’s still Windows 8 with a facelift that suits desktop users in other words. The technical preview is requesting that you (the tester) submit your views and opinions as you use it. That’s probably the most important improvement – the user opinion factor. So if you have an extra box laying around that you use for testing – try it. Put your two cents in and try to make the OS a bit better in the end. → IE11 Menu Addons – New Version – 1 – Happy New Year!